This was going to be a longer post, but we have been SOOO busy at the shop today! This is my first chance to sit down, and that's only because I have two other workers here! So knitting content! I whipped this up, out of some yarn that I dyed. I wasn't happy with the color at first, and I wanted to see how color fast my dye jobs really are. I also wanted to see if I could felt in a front load washer. The answers are, very damn color fast thank you very much, and YES! 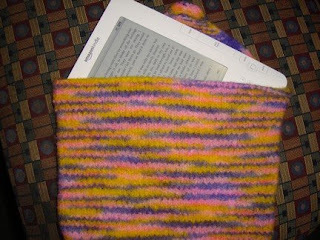 So a quickie kindle cover! I still need to sew the button on to hold it shut! Pretty cute though huh? And after felting, I absolutely love the color combo! I'm going to have to do another skein in the same colors!